We are leading Manufacturer and Supplier of good quality Aggregate Jaw Crusher. Aggregate Jaw Crusher is especially designed for fast crushing of aggregates ores, minerals, coke, coal, chemicals and similar materials. Our Aggregate Jaw Crusher is compact and of rugged construction for general laboratory and small pilot plant operations. 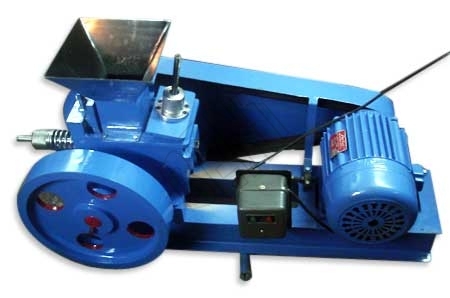 This laboratory jaw crusher is available with two jaws of manganese steel. The mobile jaw creates two blows for every revolution thereby minimizing the sizing to a minimum. A combination of downward and forward strokes having a rocking action exerts pressure on the coarser material, yet allows the finished material to move through the jaws. For feeding material, a hopper is available on the top. The smooth jaws ensure a uniform product thereby allowing easy cleaning.